Don’t like spicy food? maybe after reading this, you’ll want to add some spices here and there. Spicy food doesn’t have to mean HOT, CHILLI spicy food. There are so many spices out there that have very different tastes: sour, bitter, pungent, sweet, astringent. Each spice has so many health benefits, ranging every type of disease. Western diets don’t include many spices in their foods and there are so many more cases of heart diseases, Diabetes or Alzheimer’s than, say, India. Using spices is a natural way to prevent or cure some sort of illness, without having to depend on pharmaceuticals. 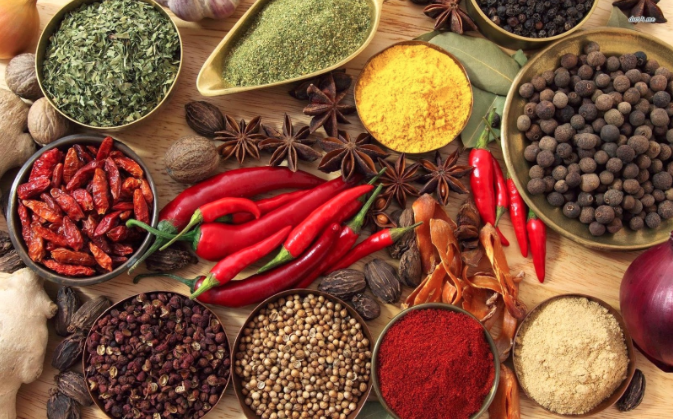 Spices originated in India, Indonesia and other areas of southern Asia. They were then exported in Syria and Egypt around 2600 BC. Egyptians and Romans used spices in their daily rituals and in particular they would use cinnamon in the embalming process, or use them to decorate their temples, for their big banquets/feasts, as preservatives, to perfume rooms and flavor foods and wine. Arabs controlled the spice market from 3000 BC till 200 BC. Romans took over the control of the trade till the 12th century. Europeans ( Spain and Portugal) started to explore passages to the East and that’s when C. Columbus went searching for the Island of Spices, but he found Americas instead. By 1700 spices were grown in many parts of the world and in big quantities, becoming one of the wealthiest trades. Spices contain a big amount of phytonutrients. Today we know that it is often the harsher, sharper-tasting plants or skins that contain active phytochemicals; it is these compounds that provide a wide range of vital health benefits for plants, animals and humans. The wide array of antioxidants and other phytochemicals found in spices have potent protective effects against cancer, heart disease, diabetes, obesity, Alzheimer’s disease and can slow the aging process too. Plants use them to protect themselves against disease and insect attack, while in animals and humans they help to prevent infection, parasite infestation. In other words, the piquant flavors, strong smells and bright colors characteristic of spices are a hallmark of the important phytochemicals such plants contain. When taken on their own, many of them have overwhelmingly strong flavors and may be very unpleasant to eat. However, choice was not a luxury often bestowed on our ancestors and unpalatable foods, in the absence of tastier alternatives, were frequently the only forms of nourishment available to them. Nomadic people consumed a broad range of different species of these pungent plants moving from region to region. However, when agrarian communities began to form, the variety of plant species consumed by these societies decreased, and they became dependent on a small selection and limited variety of wild plants. CURCUMIN has important anti tumor properties and studies have shown that it’s able to aid to many other diseases. It is found only in turmeric. PIPERINE, found in black pepper, makes you sneeze and protects brain cells. GALAGIN, aids in arthritis, found only in an Asian spice called Galang. DIOSGENIN, found in fenugreek, helps lower inflammation and kill cancer cells. EUGENOL is found in cloves and is what gives them a strong perfume, is a strong natural pain reliever. ROSMARINIC ACID makes rosemary one of the planet’s strongest antioxidant. GINGEROL, found in ginger, helps alleviate nausea symptoms. CAPSAICIN, found in peppers, can help alleviate symptoms of arthritis, and psoriasis. HYDROXYCITRIC ACID is found in the Indian spice Kokum and is a potent appetite inhibitor.As most of us have learned by experience, spices are delicious when used as seasonings, but few of them are considered much of a delicacy when consumed on their own – the form in which these foods were generally eaten by our hunter-gatherer ancestors. To most of us, even the thought of eating a ginger root, cinnamon bark, or chewing on a clove is thoroughly unpleasant, but for our ancestors this would not have been much of a hardship. As they were forced to eat them out of necessity, our ancestors probably came to enjoy the intense flavor experience that many of these spicy plants provided. The major factor underlying the difference in tastes between modern and ancient societies, and between different cultures today, can be attributed simply to conditioning: when we are exposed to a food at a young age or for long enough period later on in life, we are more likely to acquire a liking for it. We initially find a flavor unpleasant or even revolting, but after subsequent exposure to the same food, we begin to find the taste maybe even delicious. The second important factor that influenced the palatability of spices to our ancestors was the relative strength of flavors between different foods. To understand this, it is necessary to consider that most of the fruit and vegetable species eaten by early societies were stronger tasting and less sweet than they are today. In fact, the majority of modern plant-food cultivars bear very little resemblance to those varieties that grew thousands of years ago: the bitter, sour and astringent flavors that characterized fruits such as apples, melons, pears and many others have been bred out by generations of selective propagation. The cultivation of these species has also increased the sugar content of their fruits and reduced the amount of tangy chemicals that plants produce as defenses against microbe and insect attack. In other words, our ancestors were far more accustomed to eating fruit and vegetables that had less sugar but sharper flavors than many of those that are available to us at present. 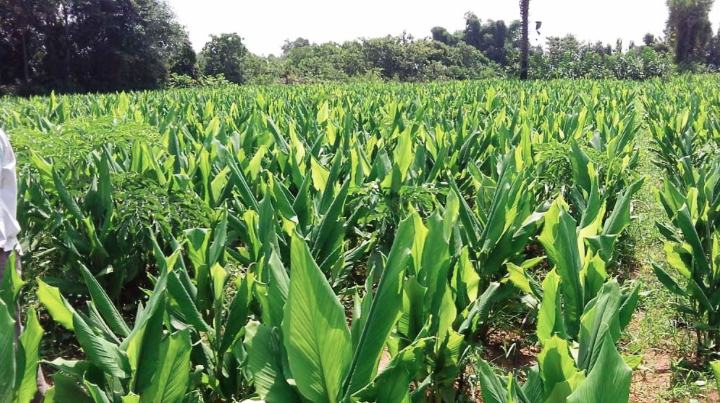 Before the advent of crop cultivation and plant breeding, there was not as big a gap between the piquancy of fruits and vegetables and that of spice plants as there is today. Therefore our ancestors would have found it a lot easier to eat the “spicy” plants than we do now. As food additives, spices were not just valuable flavorings. Many of them became prized as food colorants that could be used to dramatically enhance the appeal of the typically bland-looking foods derived from cultivated crops. In the natural world, where appearance and flavor often go hand in hand, our attraction to colorful foods is an instinctive reaction. Humans and animals are initially attracted to a plant food by its color; they are then rewarded by its flavor and return the favor by spreading the plant’s seeds. Although in modern societies we no longer play the role of seed disseminators, the attraction to the color of food persists. If we consider the rainbow of colors use in processed foods today, it is easy to understand how strongly visual appeal still influences the attractiveness of foods. Packaged foods have bright designs on their labels, sweets and beverages contain added coloring as do processed meats and dairy products. All of these are examples of how food manufacturers and vendors rely on aesthetics to attract people to their products. Today, unfortunately, most of these visual effects are achieved with the help of synthetic pigments. In traditional Eastern and Mediterranean cooking, however, the addition of strongly colored spices such as saffron, turmeric and paprika, or the adornment of food with the fresh green leaves of basil, parsley or mint remains an integral part of food preparation. The visual effects of these bright spices are equal to, if not better than, those provided by the synthetic alternatives, and natural colorants have numerous attendant health benefits. In plants, rich and bright colors, like strong flavors, are often produced by the powerful, protective phytochemicals such as flavonoids, polyphenols and carotenoids, that, when consumed regularly and in sufficient quantities, provide a wide range of health benefits. Drying of food was one solution, as was the use of the refrigerant effect of the low temperatures found at higher altitudes and latitudes. However, until recent times, the desiccation and freezing of food was not a viable option for that significant part of the world’s population living in the hot, humid tropical and subtropical regions. In warmer climates, man was thus forced to become more innovative in his food storage techniques and discovered chemical preservation, in the form of salt and spices. As the former was only available in certain places (in the days before long distance bulk transport), spices were often the only other option. Scientists have now confirmed that many of the culinary spices, typically used in warmer countries, have strong antimicrobial properties that assist in the preservation of meat or, when used during cooking, can kill microbes or neutralize toxins that have already contaminated the food. A number of familiar culinary plants show remarkable antimicrobial effects. The most potent of these include garlic, onion, allspice and oregano, followed by thyme, cinnamon, tarragon, cumin and capsicums (including chilies and other hot peppers). dietary and lifestyle factors like basic nourishment, smoking, drinking, environmental pollution and quality of medical services are taken into account). For example, a typical adult living in India – where the very low rates of most cancers, heart disease and Alzheimer’s disease have been attributed to high consumption of a variety of spices – consumes almost 10 grams of spices per day! Why do developed countries not consume many spices, given their cheap origin and high accessibility thanks to today’s trade markets? One reason is that salt or sugar are often considered to provide sufficient flavor enhancement. From a very low age our palates have become accustomed to foods high in sugar or salt, which tends to inhibit our appreciation of other flavors. Another factor is the extensive use by the food industry of cheap artificial flavors and colorings that became available in the West over the last century, which dramatically enhance the taste and visual appeal of foods in the same way that spices do. They are extremely cheap and are found in almost every packaged food. Production of spices keeps growing in the world. In 1965, about 1.7 million tons of spices were produced annually. In 2005, 6.6 million were produced. It is difficult to know precisely how much a single country produces because there are several confusions regarding production, exportation and marketing. And many underdeveloped countries don’t communicate their data. India, Nepal and Pakistan are number one producers (55%), followed by Indonesia, Thailand and Vietnam, which account for 12 %, and China for 10%. Europe and Middle Eastern countries have started to grow spices too in greenhouses, but many spices don’t adapt well to continental climates. I’ve tried to find out the processes of industrialization or production of spices, but it’s not that easy on the web. 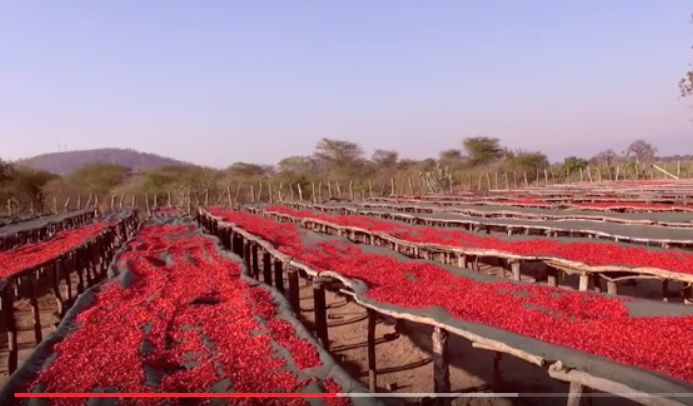 After looking at various videos on youtube of spice farms, I understood a bit better how it all works. Every spice has a different type of growing and picking process of course. Basically the spices need to be shelled to get to the seed part or the skin taken off if they are roots. 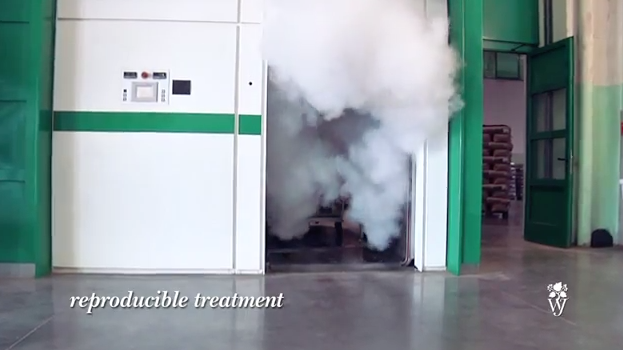 Then they get fumigated or sterilized with steam to get rid of potential insects or bacteria. They get dried and roasted, and eventually get ground into powder. 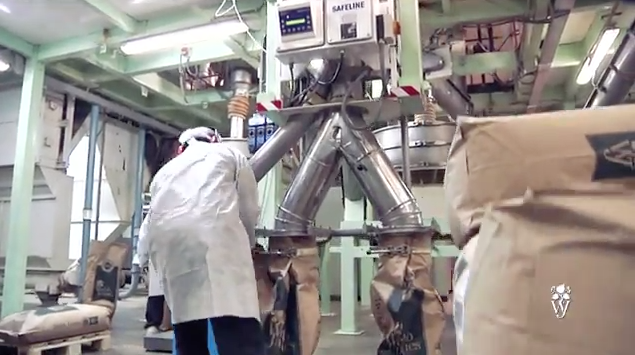 If it is a big production it involves a lot of machinery, sterilization and machine picking. 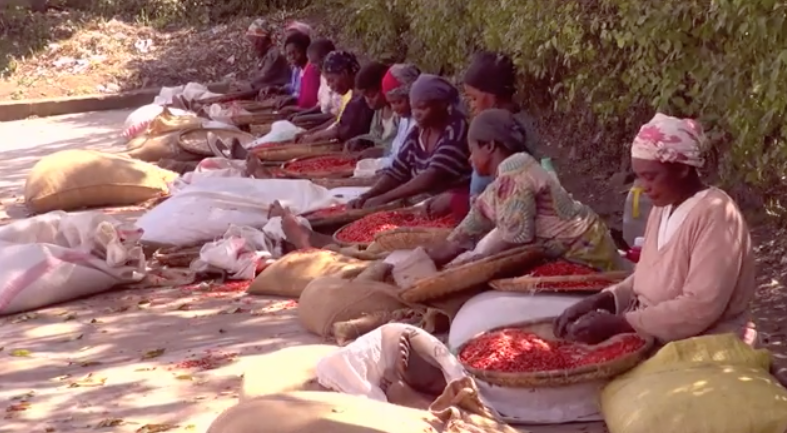 But there are smaller spice farms (even organic) that do everything manually and sun-dry the spices, which is much more appealing than using machines and chemicals. 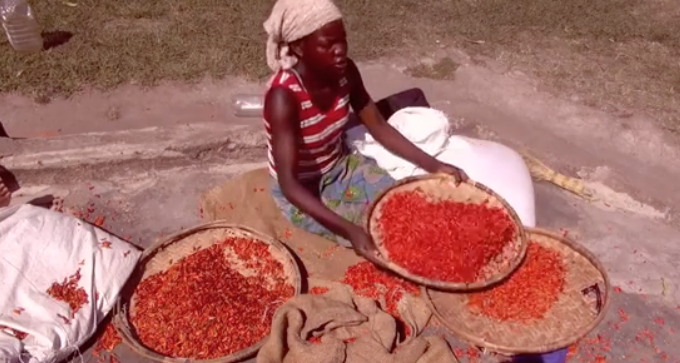 Below are some photos of spice production. Dry-roast whole spices and grind: this method is used to drive off excess moisture, makes the seeds crisper so they ground more easily and it changes flavor, because when spices get heated they release volatile aromatics, adding complexity. Fry in oil and then pound. It would be best to buy whole, toast on the pan and then grind yourself instead of buying already in powder. If the spice doesn’t smell much, then it is not fresh anymore and should be replaced. Always keep away fro heat and light. It’s tricky to understand what work was done exactly to produce that small box of spices you find at the supermarket, of course it would be better to buy organic and hoping they didn’t use sterilization methods by fumigating with chemicals, but it’s not clear from the packaging if machinery was used or not. The best option would be to make your own spices, but sometimes we cannot find fresh ingredients, like cardamom or cinnamon sticks. I’ve made homemade turmeric powder and red pepper powder, it’s SOOOO much better than bought spices, the taste is stronger and the color more vibrant. It takes a bit of time, but it’s totally worth it.